I’m a certified all breed groomer with 30+ years of experience and have owned poodles all my life. We are located in Riverton Wyoming. It has been my life-long dream to raise toy poodles and now that my kids are grown, I’ve decided to follow that dream. I’m helped of course by my wonderful husband and 2 animal loving daughters. Over the past 20 years I’ve come in contact with many poodle breeders who have shared their knowledge and continue to mentor me so I can raise healthy, happy, beautiful poodles. Our puppies are bred primarily for amazing family pets and their Natural Service and “Medic Alert” dog potential. We do get show and agility potential puppies as well. We do try our best to get to know our buyers BEFORE they decide on a puppy from us. We do care about your home, family, other pets, and lifestyle and want to make sure our babies are the perfect fit for the families they join. Please fill out our puppy application if you are interested in one of our babies so we can get to know you a little bit. Our poodles are beloved pampered house pets. NONE of our dogs are raised in cages. 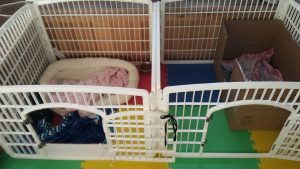 We do have crate “bed rooms” for each of our dogs for feeding (they all have different nutritional requirements) and also for times we aren’t home to supervise them…. you wouldn’t believe how much mischief 8 poodles can get into when you go to the grocery store!. 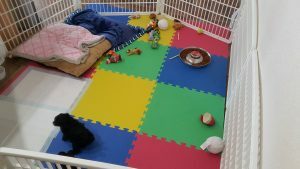 We have puppy play pens for safety and sanitary concerns that we have our puppy babies in but each of our breeding dogs as well as pups get time on the bed, couch, lap, car rides, outdoor fun in our large yard. Our poodles are exposed to kids, adults, other dogs, cats, rabbits and antelope! Yes, all 8 of our poodles sleep in our beds with us…they are FAMILY members first and foremost. We have our babies next to our bed at night so the moms can still sleep with us and then check on babies and feed them through the nights. 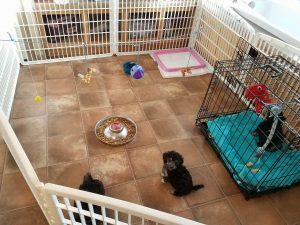 Once the babies are 4 wks old we move them to “puppy kindergarden” which is a big play pen filled with soft beds, food, water, potty pads and tons of toys. This is in the middle of our house so they are used to all normal household noises and get lots of picking up, kisses and tummy tickles all throughout the day. We believe that adding a poodle to your life IS adding a family member. These are “little people in dog suits”. They all have individual and unique personalities and we do try to match our puppies with the perfect families suited to them. We are happy to give you names and numbers of references including the veterinarians we use. They will be happy to provide prospective new puppy parents with information as to the quality, general health and soundness of our poodles. Our poodles have been tested and passed “clear” or “normal” for PRA / PRCD eye diseases. We highly recommend spaying or neutering your new puppy at the appropriate age recommended by your veterinarian. Each new puppy will come with the necessary paper work for registration with the American Kennel Club with Limited Registration (no breeding Rights). Our puppies are not sold with breeding rights. I will not knowingly sell one of my poodles to a puppy mill or indiscriminate breeder. Full registration/breeding rights will only be available on puppies we deem “breeding quality” and only to those owners we can confirm will breed with high regard to the Poodle Standards set by The Poodle Club of America. We believe strongly in socializing all our puppies. We spend many hours with them, playing, grooming, loving and spoiling. This ensures that when they come into their new homes, they are ready to be loved and spoiled there as well. 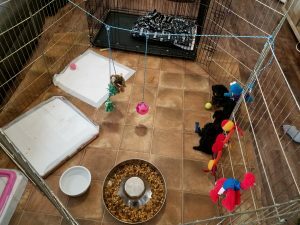 We love these little poodles and very much endeavor to provide a nurturing atmosphere that will allow each puppy to develop as a loving, loyal and well socialized little companion. We take great pride in our home and do welcome visits, however, to protect the health and well-being of our furry kids, there are some health precautions that have to be observed. Newborn puppies and mommy dogs that are close to whelping need privacy and quiet times so sometimes visitation isn’t feasible. Please recognize that being denied a visit may just be a scheduling issue. If you are looking for a high quality, healthy and beautiful toy poodle puppy send us an email expressing your interest.